Selecting a cake is one of the biggest wedding decisions many couples have to make. Should you go for a traditional tiered cake or mix things up with a selection of cupcakes? Red velvet, fruit or chocolate sponge? Cake pops for the children or chic macarons in the prettiest arrangement of pastels? With so much food for thought, Khush Wedding turned to Deelicious Nazish’s Kitchen’s owner Nazish Omar for her expert advice on the perfect wedding cake and Big Day desserts. Nazish left a high-flying job in banking to pursue her dream of becoming a baker and patissier. After earning her stripes at the prestigious patisserie school Le Cordon Bleu, Nazish enrolled herself in sugar craft and cake decorating courses before opening a Patisserie in Tooting Bec, South London. Deelicious Nazish’s Kitchen was born and its success has grown rapidly ever since. 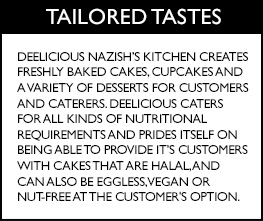 Nazish personally ensures that every scrumptious-looking creation is made using high-quality ingredients and timeless recipes to preserve the rich, luxurious taste that’s become the company’s hallmark. Nazish recommends clients come to see her for a consultation at least two months before the Big Day. Couples can taste-test slices of various cakes as well as discuss their own cake and dessert ideas with Nazish. This summer has undoubtably been Nazish’s busiest yet with orders of over a thousand desserts and multiple wedding cakes commissions coming in weekly. Vintage styles are making a comeback this summer with cakes finished in lace-like designs in classic ivory and champagne while popular flavours incluce passionfruit, pistachio-cardamom and vanilla sponge with strawberry jam. Cupcakes are enjoying a moment in the spotlight recently, and are a popular treat to offer guests at pre-wedding events and of course, on the Big Day itself. Deelicious whips up these hand-sized creations in over 20 flavours including mocha, caramel-ginger and passionfruit, proving these childhood delights are not just for kids. Deelicious makes macarons in several flavours including salted caramel, pistachio and lemon. The lovely desserts make a great alternative to a slice of cake and can be given as wedding favours to guests on their way home. Deelicious is especially proud of its dessert offering. Nazish works closely with many of London’s top Asian caterers and supplies them with desserts for both functions and weddings alike. The Deelicious team specializes in creating and setting up extravagant dessert buffets with treats such as mini cheesecakes, shot glass desserts, profiteroles and petit fours. Whether you want the all-singing, all-dancing traditional wedding cake or a more contemporary confection, Deelicious promises to create a wedding cake that truly befits the specialness of your Big Day. Nazish and her skilled team can match your cake to your outfit, carefully mimicking the embroidery from your bridal lengha onto fondant covered sponge. 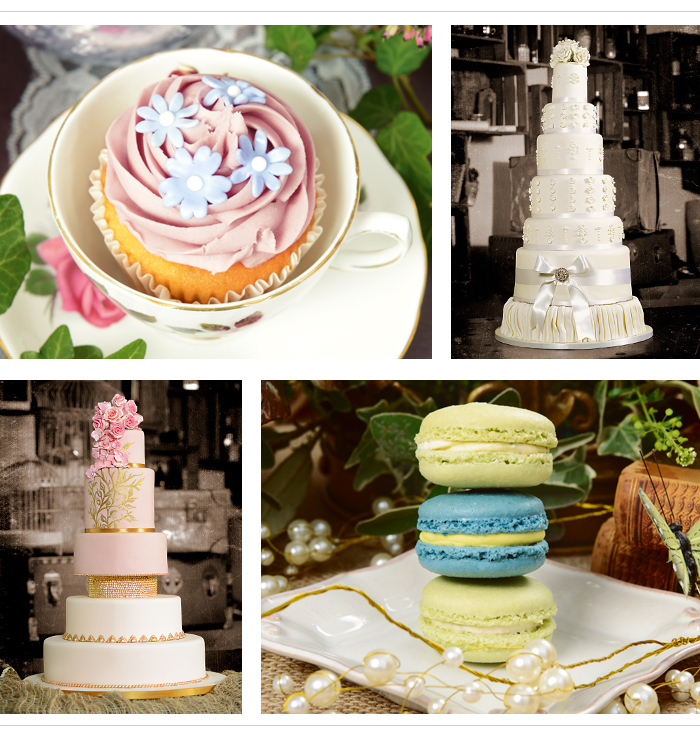 Deelicious’s expert bakers will work with you to design a cake as unique and memorable as your wedding day, offering ideas and taking on board suggestions, tastes and nutritional requirements to create a cake that will delight your tastebuds.